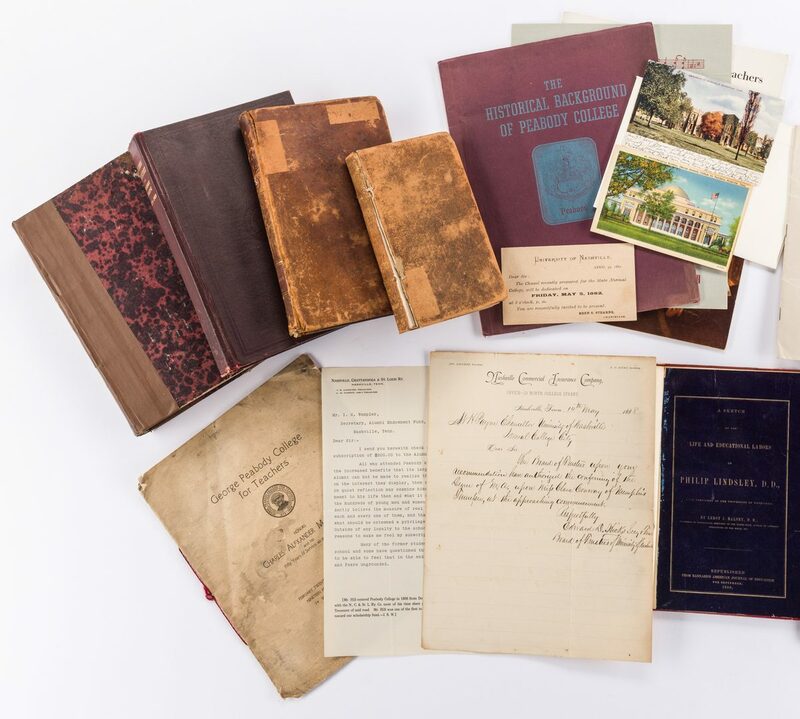 Archive of seventeen (17) books and ephemera related to Philip Lindsley, first president of the University of Nashville. Includes some of his personal books, plus other publications related to Peabody College, Nashville, Tennessee (formed when the University of Nashville split into "preparatory" and "normal" schools in 1875). 1st item: "A Sketch of The Life And Educational Labors of Phillip Lindsley, D.D., Late President of The University of Nashville" by Leroy J. Halsey, D.D., republished from Barnard's American Journal of Education, September 1859. Library of Congress (LOC) ex libris label indicating this as the 3rd copy, inside of front cover, deaccession stamp, front end paper, additional LOC stamp, title page, LOC sticker, front cover. Includes steel cut engraved frontispiece, engraved by Tilman and Sons after a painting by J. W. Dodge, published by J.B. Lippincott and Co., Philadelphia. Depicts Lindsley sitting in a high backed chair, books propped at right hand, a walking stick in his left. Engraving – 5" H x 4" W. Book – 9 3/8" H x 6" W. 2nd item: "Dionysius Longinus on the Sublime" 1st American edition, printed by Ebenezer F. Backus, New York, 1812. Greek and Latin text. "PH. Lindsley, and N. L. Lindsley", inscribed inside of front cover, inscription in Latin, front end paper and some text pages. 8 1/2" H x 5 1/2" W x 1 1/4" D. 3rd item: "Cabinet of History: The History of Switzerland", conducted by The Rev. Dionysius Lardner, Carey and Lea, Philadelphia, 1832. "Lindsley", inscribed inside of front cover. 7" H x 4 3/8" W x 7/8" D. 4th item: Two (2) books bound in one volume. "The History of The Christian Church, During The Three First Centuries" by Dr. Augustus Neander, published by James M. Campbell and Company, Philadelphia, 1843, and "History of the Reformation in Germany" by Leopold Ranke, translated by Sarah Austin, published by Lea and Blanchard, 1844. "P. Lindsley", inscribed inside of front cover. 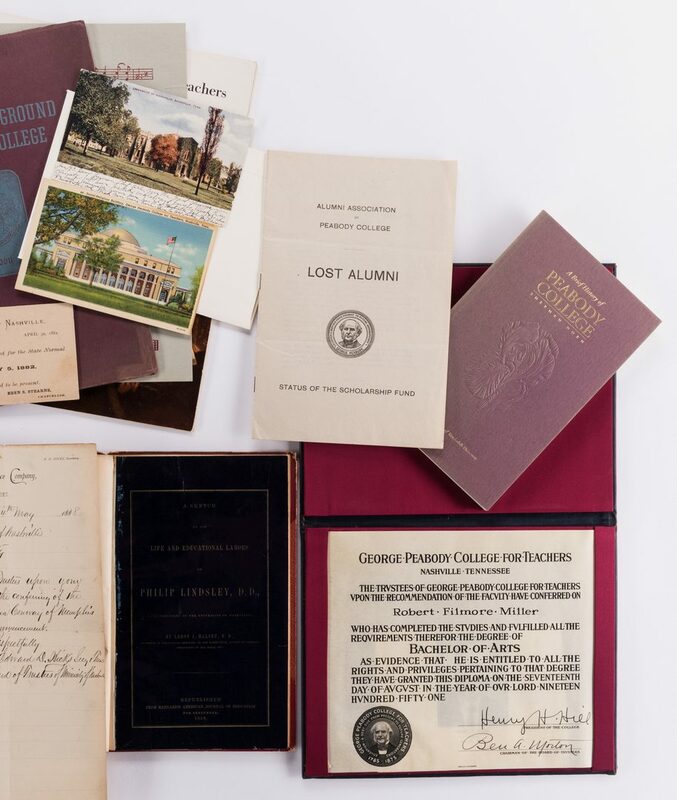 9 1/2" H x 6" W x 1 3/4" D. 5th item: George Peabody College for Teachers Bachelor of Arts degree, awarded to Robert Filmore Miller, signed by Henry H. Hill, President, and Beu A. Morton, Chairman of the Board of Trustees, August 17, 1951. Housed in a navy leather folder with gilt lettering and tooled image of college seal. 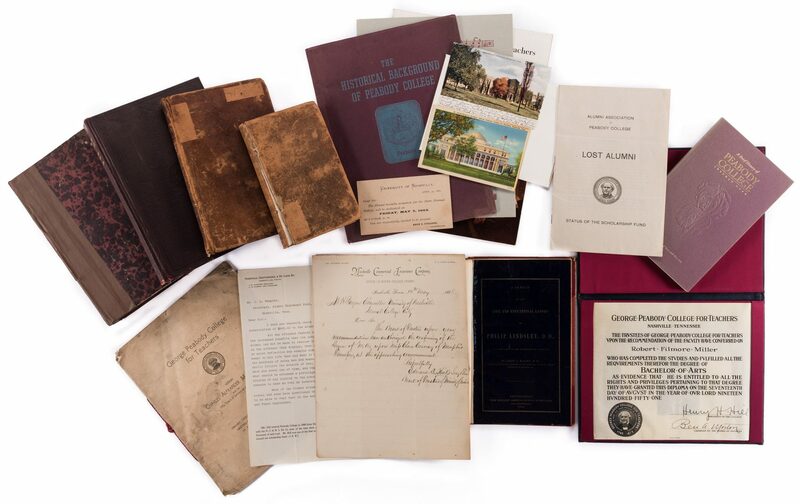 Diploma sight – 7 1/2" H x 8 3/8" W. Folder – 8" H x 10" W x 1/2" D. 6th-11th items: Group of six (6) Peabody College books/pamphlets, including "Alumni Directory of Peabody College (1875-1909) Nashville, Tennessee", circa 1909, "Lost Alumni", circa 1912, "George Peabody College for Teachers Honors Charles Alexander McMurry", 1929, "The Historical Background of Peabody College", 1941, "George Peabody College for Teachers, Historical Bulletin", circa 1945, and "A Brief History of Peabody College" by Sherman Dorn, 1996. Books/pamphlets range in size from 8" H x 5 1/8" W x 3/8" D to 11 5/8" W x 1/8" D. 12th-17th items: Group of six (6) Peabody Alumni related documents and postcards, including letter written by Edward D. Hicks, Secretery and Treasurer, Board of Trustees of Ministry of Nashville, to A. H. Payne, Chancellor, Ministry of Nashville, requesting that he authorize the conferring of the degree of M.A. (Master of Arts) to Mi(s)s Clara Conway, dated May 14, 1888, and invitation addressed to Hicks for the dedication of the Chapel in the State Normal College, May 5, 1882, a typed letter from James B. Hill to Mr. I. S. Wampler, Secretary, Alumni Endowment, Nashville, TN, dated February 7, 1912, one postcard depicting the Social Religious Building, George Peabody College for Teachers, one depicting the university of Nashville, and double sided sheet music for "Peabody Alma Mater" and "Pillars of Peabody", 1938. Items range in size from 3" H x 5 1/8" W to 1 3/8" H x 8 5/8" W. All items housed in a 10 3/8" H x 13" W x 6 1/2" D. white archival box. CONDITION: 1st item: Toning impression of engraving, page opposite frontispiece. Pages exhibit foxing spots, toning, to be expected from age. Cover in worn condition. 2nd item – Front cover separated from spine. Pages exhibit dampstaining, foxing spots, to be expected from age. Worn leather cover. 3rd item – Front cover almost separated from spine. Pages exhibit foxing spots, toning, to be expected from age. Library stamp, edges of pages. 4th item – Spine rebound in contemporary materials. Pages exhibit foxing spots, toning, to be expected from age. 5th item – Overall good condition. Label with receipient's name and degree, top right of folder cover. Wear, edges of folder. 6th-11th items – Sticker residue, bottom of spine of Directory. Light toning, surface of pages. McMurry pamphlet exhibits dampstaining, foxing spots, tears, to be expected from age. Other books/pamphlets in condition commensurate with ages. 12th-16th items: Overall good condition. Foxing spots, surface of sheet. Toning, edges of sheet. 1/4" tear, right of horizontal fold line.